Home / Weight Loss / Real Weight Loss Stories / Story 4: Fitness App Co-Founder Arushi Verma Reveals The Changes She Made To Lose 16 Kgs! Story 4: Fitness App Co-Founder Arushi Verma Reveals The Changes She Made To Lose 16 Kgs! Today, we have with us an incredible story of passion & determination to be fit. Arushi Verma is the Co- Founder and product lead at FITPASS which connects fitness enthusiasts to the best gyms and studios in their vicinity with unlimited access to lakhs of different workouts. With a B.A. in Economics from Delhi University, Arushi pursued her Master’s in Development Economics from the School of Oriental and African Studies, University of London. She began her career as a Research Associate from ASER Centre, New Delhi and later went on to work with the World Bank as a consultant, before committing herself completely to Fitpass. About 6 months in which I lost 16 kgs. I am the Co-founder, FITPASS. 27 years old. Avid traveler. Harry Potter fan. Badminton enthusiast. Dog lover. Meticulous, creative and innovative, and a people person. There were a few reasons actually – firstly, I was feeling unhealthy and uncomfortable with my weight. It was leading to some hormonal imbalances as well. Secondly, I’m the co-founder of a fitness app, I should be fit! And thirdly, my brother was getting married. I think that’s were all my motivation came from. Through controlling my diet and doing yoga three times a week. And needing to be strict with myself. I had started eating out a lot: 2-3 times a week. I strictly changed that to only Saturday’s and stuck to roasted chicken so I wasn’t really having anything fried. I also began having a light breakfast and moved up my dinner time to 7-7:30 PM. Typical diet was waking up to aloe vera juice, followed by dry fruits while exercising, fruits for breakfast, green tea, followed by lunch which was one chapatti with a bowl of veggies or curd. Afternoon was a cup of green tea and tea or coffee an hour later. And then dinner at 7-7:30, which was either the same as lunch, or a bowl of soup or a sandwich. If I ever felt hungry post dinner, I would have another cup of green tea or some healthy crackers as snacks. I started waking up at 6:30 AM to be able to exercise. There was never any time during the day to exercise and my body needed me to do it so I could lose weight. It was that motivation and determination that helped me wake up early. I feel great and much healthier but I still feel I have a long way to go. 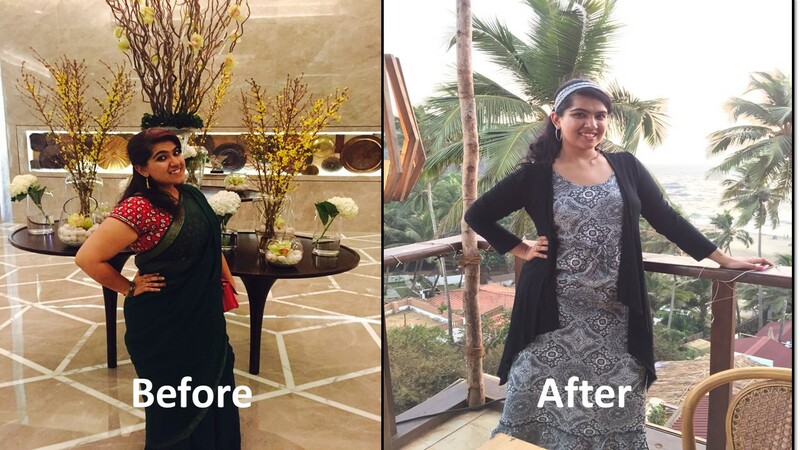 If Arushi’s story inspired you, click here to read more such spectacular weight loss stories!